Norwegian Air International, continuously awarded as “World’s best low-cost long-haul airline” and “best low-cost airline in Europe” by Skytrax, has just greatly discounted non-stop flights between London Gatwick and Rio de Janeiro, one of the most iconic cities in South America! You can book roundtrip tickets (direct service in both ways) on board of Boeing 787-9 Dreamliner already for £320! As mentioned this is a low-cost solution from the UK to Brazil..there is only 10kg hand luggage in base fare. If you want checked luggage (20kg), seat reservation and onboard meals you would need to add £50 each way..Take advantage of this promotion and book discounted Norwegian flights on their new route between London and Brazil..
Norwegian is offering the cheapest flights from London to Rio de Janeiro when traveling from 17th of April to 10th of July or 11th of August to 11th of December 2019. At this moment there is great availability. Our deal is based on direct booking with the airline where you can easily compare all the cheapest travel dates. 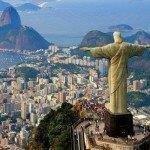 You can book your accommodation in Rio de Janeiro via Hotels.com or Booking.com. Travel days with Norwegian. You can complare all the cheapest travel dates here. Outbound on Monday, Wednesday, Friday or Sunday. Inbound on Monday, Wednesday, Saturday or Sunday. See also: UK – Rio de Janeiro from £393 (Lufthansa flights with a layover but including checked luggage). Booking sample of Norwegian cheap non-stop flights London to Rio de Janeiro for £320! In this case you would depart from the United Kingdom to Brazil on 14th of April. Return from Rio de Janeiro back to London Gatwick on 28th of April 2019.